uppertail-coverts distinctive. Gregarious and wary; flocks on jheels and winter cultivation; rests for most of day and feeds during night, on water and on agricultural land, especially freshly sown fields. The Bar-headed Goose A. indicus breeds in Ladakh and winters in subcontinent. grass, shoots of winter crops like gram and wheat; aquatic tubers. winter visitor; early October to mid- March; most common in N India, across the Gangetic plain to Assam, Orissa; south to N Gujarat; Madhya Pradesh; rarer south. 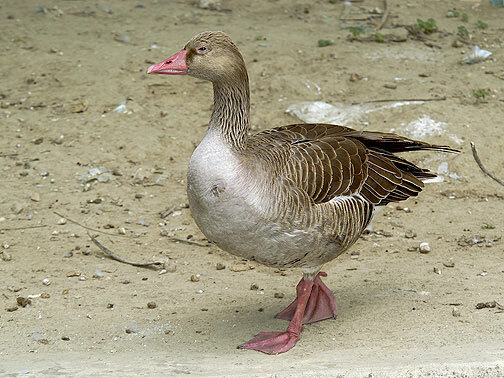 domestic goose-like, single-note honk, often uttered several times, loud and ringing; typical geese gaggles when feeding.